A god has fallen, leaving an opening in the Pantheon. 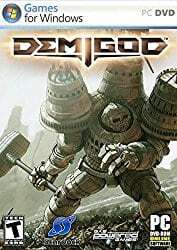 Become a Demigod and wage war in spectacular arenas to ascend to godhood in this real-time action/strategy game from the creators of Supreme Commander and Dungeon Siege. Demigod isn’t your typical strategy game. It combines the best elements of real-time strategy and role-playing games. Control one of eight unique Demigods and fight in eight spectacular arenas, earning experience and gold you can use to acquire new abilities, purchase new equipment, and to upgrade your team’s war effort. The free Steam client is required to install this game.